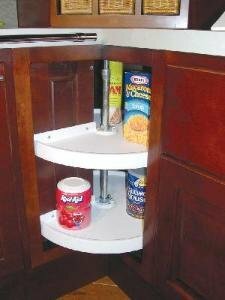 The Pie-Cut Shelving System is excellent for maximizing kitchen cabinet space efficiently. This item MOUNTS TO THE DOOR. The Pie-Cut Shelving system has been engineered to offer the most complete size range and flexibility of any other system. The door mounts on the shelving unit. Includes two shelves, telescoping shaft assembly to accommodate 26"-32" inside cabinet height, top and bottom pivot-complete with screws. 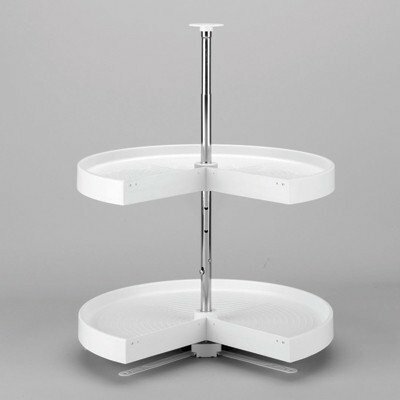 Replacement shelf for Dependently Rotating Pie-Cut Lazy Susan. White 24 Inch diameter. Replacement shelf for the 6942 Series Shelf Set. 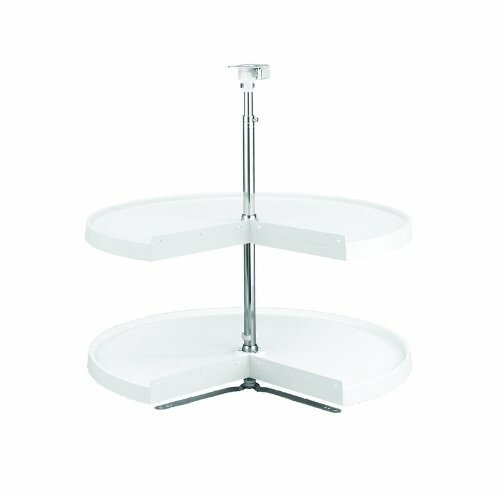 Single Shelf Only and mounting hardware. 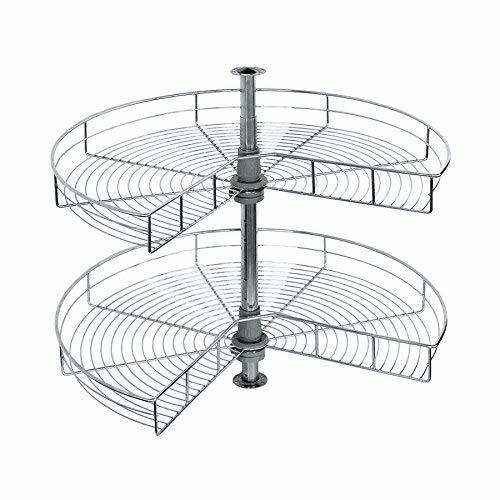 Lazy Daisy Polymer Pie Cut 2 shelf susan sets are economical and have zinc plated steel posts and hardware. 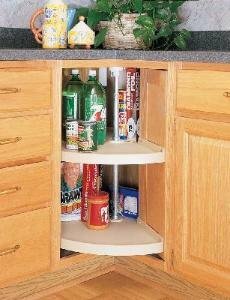 Doors attach directly to susan shelves. For 90degrees corner cabinets with doors attached directly to susan shelves. Positive action centering hardware keeps unit centered on cabinet opening when not in use. Almond or White polymer. Set includes: (2) polymer shelves, (1) 26"-32", 1" diameter telescoping post, (1) pair top and bottom pivots. Screws and instructions. Zinc plated steel post assembly. Tested to exceed BHMA Class 1 Specifications. Color: Almond. SIze: 28". Pie Cut Chrome Lazy Susan Kitchen Cabinet Base Corner Organizer 24" is the actual diameter so please allow enough room for installation Size: Dia.24" 270 degree (Look at simplified diagram） For Base Corner Cabinets with independently hinged doors 40 lbs max capacity per shelf (13.5 pounds/pc---- Sufficient strength ) Return Policy We accept return/exchange for damaged (in transit) or defective items only within 30 days of receipt. Buyer will pay for the return shipping cost. Shipping Item will be shipped out in 1-2 business day upon payment received Shipping for all products is insured We do not ship to P.O. Box, Puerto Rico, Alaska and Sales tax will be added to all orders to New York addresses Contact US Please contact us through message with any questions. Our customer service team will get back to you in 1 business day Business Hour Mon-Sat 9:00 AM- 5:00 PM Sun Closed About Us We are located in NY, NY and the large distributor of kitchen, bathroom and flooring all the remodeling products. Our goal is providing the best quality and best price to our customers. Lazy Daisy Polymer Pie Cut 2 shelf susan sets are economical and have zinc plated steel posts and hardware. Doors attach directly to susan shelves. For 90degrees corner cabinets with doors attached directly to susan shelves. Positive action centering hardware keeps unit centered on cabinet opening when not in use. Almond or White polymer. Set includes: (2) polymer shelves, (1) 26"-32", 1" diameter telescoping post, (1) pair top and bottom pivots. Screws and instructions. Zinc plated steel post assembly. Tested to exceed BHMA Class 1 Specifications. Color: White. SIze: 24". 24 in. diameter. The measurement pie cut to door is 11 in. Looking for more Diameter Pie Cut Lazy Susan similar ideas? Try to explore these searches: Dr Reversible Chrome Ratchet, Sectional Klaussner Furniture, and Ginkgo 60 Capsules. Look at latest related video about Diameter Pie Cut Lazy Susan. Shopwizion.com is the smartest way for online shopping: compare prices of leading online shops for best deals around the web. Don't miss TOP Diameter Pie Cut Lazy Susan deals, updated daily.